In 2015, when my wife, Brenda, and I told our two adult children and their families that we were buying a condo in Costa Rica, we did not get the usual guarded responses, nor the dreaded “What are you thinking?” Our kids cheered and stomped and hooted. They were thrilled. We had looked at properties in a number of countries, but in the end, we chose Costa Rica because we loved it. For 11 years, from 1992 to 2003, we had lived in Costa Rica, raising our family, and working at an international school as a teacher and a principal. We had lived the Tico life: faced the struggles, overcome the language barriers, dealt with the frustrating perspectives on time. We’d navigated the details of paying bills, finding services, and getting even the most basic things done. We were eager to return. We searched the internet for properties on the coast of Costa Rica and contacted a real estate agent to open discussions. After finding several properties we were interested in, we scheduled a visit to Costa Rica. Since we were ready to buy, we were just waiting for the right property to present itself. Security and rentability were two important factors. When we walked into our condo and sat down for the first time, I could tell by the smile on my wife’s face that her assessment matched mine. This was the place. Our condo, which we named Comfy Condo, is in a small gated community in Jaco on the central Pacific Coast. We chose Jaco because we love the beach and enjoy walks along the shore. Jaco boasts lovely flora and fauna, and there is an energetic vibe to the community. We wanted a location with a steady stream of visitors…for rental purposes. The property cost $65,000 and we have found it to be very viable as a vacation rental. It has two bedrooms, is fully air-conditioned, and sleeps six comfortably. It has a living room/lounge area with a kitchenette and dining area, including refrigerator, sink and counter, stovetop, and cupboards. We love the outside patio (perfect for breakfast). A bathroom with shower rounds out the layout. It is about 600 square feet and light and airy. Best of all, it’s a mere five-minute walk to the ocean and to restaurants and shops. For renting out our home, we use the services of a management couple. This was the smartest move we made. Our managers handle all the on-site oversight of the property: maintenance, cleaning, and repairs, plus paying taxes, utility bills and home-owners’ fees. They also serve as hosts, meeting guests, getting them settled, and handling any needs and concerns during their stay. The second smart thing we did was to list the property on Airbnb, VRBO, and Flipkey. These sites are set up to organize, promote, and facilitate the renting of your property. My wife and I handle the bookings online. Good communication between ourselves and our managers regarding reservations, cleaning, and hosting makes for smooth sailing in the renting process. These sites are easy to use, and they pay promptly. They also help screen potential renters by offering reviews of their rental histories. Rent this year has been regular and consistent. We have chosen to invest the rental income back into the property. We anticipate a clear profit in the future since all major improvements have now been completed. For anyone looking to do the same, and pick up a rental property overseas, use a reputable real estate agent or service—one who knows the laws, also speaks your language, and knows how to get things done in the country of your choice. Procedures, processes, and regulations are different in each country. If you are advised to use an attorney in the country where you are purchasing, do it. In Costa Rica, this is essential, as purchase agreements and contracts must be written as legal documents. We love our place. In fact, we love it so much, we bought a second one. It is now renting also. Both units are in the same compound, and both are renting regularly and providing income for us. The second is about 500 square feet and sleeps four. It has a full kitchen (albeit cozy) and a laundry room. With two units, our entire family can come and enjoy Jaco at the same time. In three years’ time, our plan is to spend half of our time in Costa Rica and the other half in Indiana (where the grandkids are, of course). We find ourselves on a plane frequently, making six or seven trips per year, spending as much time in our condos as possible. 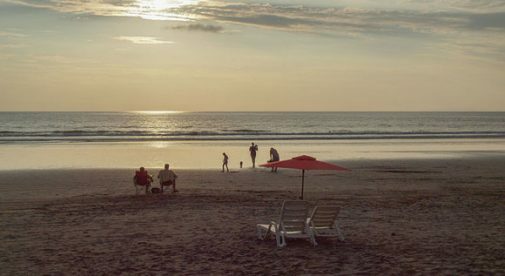 My wife, who is a writer, travels to Jaco even more frequently due to her flexible schedule. We love the weather, the people, the food, the beach, and the Pura Vida life in our small town on the Pacific Coast. It’s been one of the best decisions we’ve ever made.